The Pacific Islands Regional Planning Body was established under President Obama’s National Ocean Policy. President Trump’s National Ocean Policy rescinded the original EO 13547 and disbanded all RPBs. Ocean planning is now being developed by states, territories, and regional ocean partnerships. Federal agencies may participate if so desired. The mandate has shifted to ensuring better data and data transparency. Links to all EOs and accompanying documents are below. Data Update: The Marine Cadastre has developed a portal and mapping interface for American Samoa. This will be expanded to include Guam, CNMI, and Hawaii in the future. Guidance for Implementing the E.O. Executive Order (E.O.) 13547 (July 22, 2010), Stewardship of the Ocean, Our Coasts, and the Great Lakes, established the National Ocean Council (NOC) and among other things, directed “the development of coastal and marine spatial plans that build upon and improve existing Federal, State, tribal, local, and regional decision-making and planning processes.” The E.O. described the Pacific Islands (includes American Samoa, Commonwealth of the Northern Mariana Islands, Guam, and Hawaii) as one of nine regions where a regional planning body would be established for development of a coastal and marine spatial plan. The E.O. 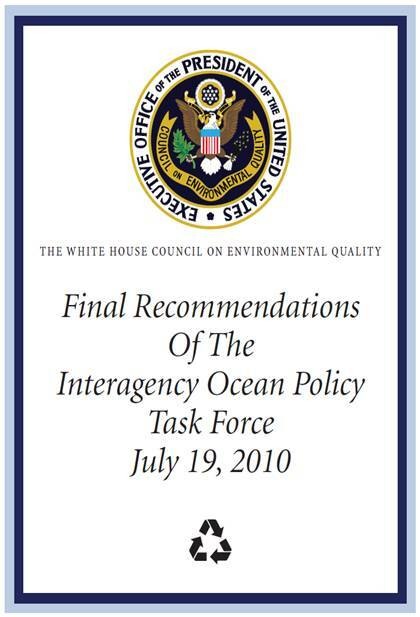 adopted the Final Recommendations of the Interagency Ocean Policy Task Force as the National Ocean Policy. The Pacific Islands Regional Planning Body (RPB) was established April 2013, however it was disbanded under President Trump’s June 2018 EO. Its members accomplished, with the heavy lifting done by the American Samoa Ocean Planning Team, the publishing of the American Samoa Ocean Plan in December 2018. The American Samoa Department of Commerce now oversees the ownership and implementation of the AS Ocean Plan. Additionally, the Marine Cadastre, a joint NOAA and BOEM partnership, developed the American Samoa CMSP Data Portal. This will be expanded to the Pacific Islands Regional Marine Mapper and include CNMI, Guam, and Hawaii in the future.